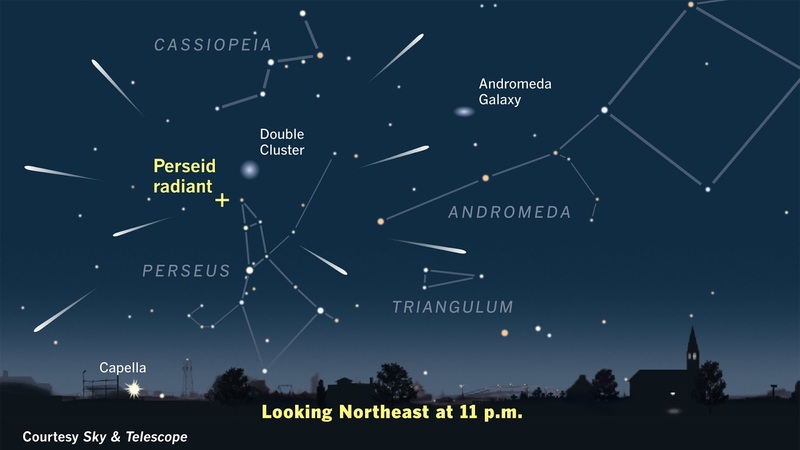 The Perseid meteors appear to stream away from the shower's radiant point near the border of Perseus and Cassiopeia. "'Stars fell like weaving in the south, unceasingly through the night.' So a city gazetteer printed in Shanxi, China, described the sky above Fenyang on August 10, 1862. 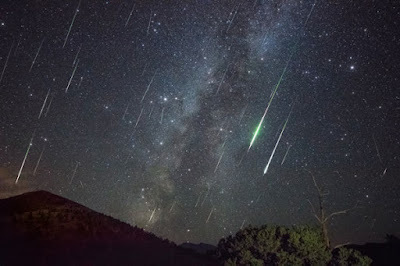 Calculating backward, scholars have determined that the 'weaving stars' witnessed by the townspeople were in fact Perseid meteors, falling at a time when the shower’s radiant, the point from which the meteors appear to emanate, lay low in the sky. The Perseids are associated with the short-period Halley-type comet 109P/Swift-Tuttle, which was independently discovered by American astronomers Lewis Swift and Horace Tuttle as it approached perihelion in July 1862. When Earth crosses Swift-Tuttle’s orbit, bits of dust and rocks left behind by the comet hit the planet’s atmosphere, creating the light show we know as the Perseid meteor shower. In years when Swift-Tuttle reaches perihelion, the number of visible meteors significantly increases, which explains the dramatic display of August 1862. Since the comet has a 133-year orbital period and last visited the inner solar system in 1992, we’ve got another 107 years to go before that possibility arises again. ..."
This composite image is made of several exposures shot at Sunset Crater, Arizona, over nearly 2 hours on the morning of August 12, 2016. The image shows 48 Perseids — including two spectacular fireballs — and 5 sporadics (meteors not associated with the Perseids, identified by the trails not in alignment with the majority).